The peasants of Sikkim had resisted a lot against the Sikkimese theocracy. After the Indian independence they were not at all in a mood to live the very same life which their forefathers lived. The earlier individual resistance they had shown against the suppression of the Kazis now began to take a shape of united resistance in which the peasants of Sikkim were searching their new avenues to live their lives. The age old concept of Devine Right of the King &Co. was at a very shaky position. This all was happening due to the geo-political situation which was prevalent not only in India after her independence, but in the entire Himalayas. It is to be noted here, that the political situation of Nepal was also coming across from the similar ups and downs which was then ubiquitous in Sikkim. The Nepali populace started an open divergence against the Rana regime for its removal. It was all happening because the resistance level of the masses in the entire Himalayas was plummeting heavily due to the suppression from the higher authorities. Likewise in Nepal, the Sikkimese peasants also began to raise their voices against the forced labors which had exploited its peasantry a lot. Unlike an open rebellion in Nepal, the peasants here began to ask for their rights through various associations founded by different leaders in the Kingdom. In the words of Howard Zinn-“The uneasiness grows and grows and the citizenry gathers in resistance in larger and larger numbers, which becomes too many to control; one day the top heavy empire collapses.” He further writes- “Change in public consciousness starts from low level discontent, at first vague, with no connection being made between the discontent and the policies of the government. And the dots begin to connect, indignation increases, and people began to speak out, organize and act”. Similar to the ideas of Howard Zinn, the small gatherings of uneducated and Bustiwallas in far flung Sikkim organized themselves and founded the first ever political party of Sikkimese Kingdom at Gangtok on 7th December 1947. They named it as SIKKIM STATE CONGRESS which was greatly inspired from its Indian counterpart the Indian National Congress. Interestingly, the flag of the said party also had a tri-color similar to that of the Party Flag of the Indian National Congress. To continue their united resistance through a political banner, the Sikkim State Congress had even made a constitution. It was meant for the execution of a member’s duties in some far off places of Sikkim. It basically deals with the code and conduct of the party members. The picture posted here is of the few pages of the said Party Constitution. Details have been provided by the document about the powers and functions of its President and other Executives. Further, the paper also offers some new ideas to understand the basic purposes of this political organization. The interesting part of the document is that a block level committee in every block was founded after the formation of the Party. To reach at the doorsteps of the peasants those blocks were further sub-divided into villages. Every member of Sikkim State Congress had to get a membership card at the cost of Rs. 1. Adults of 18 years and above were given the general membership (who wanted to join the Party). The Constitution of Sikkim State Congress had all together 12 Articles supported with many other clauses. It has given much emphasis on the discipline of the cadres and Annual Meetings. I am greatly indebted to Mr. B. B. Lhorung Rai of Kazi Tar Namchi for sharing this piece of information with me. The document is to a great extent helpful for the study of political development in the erstwhile Himalayan Kingdom of Sikkim. South Sikkim occupies an important place in igniting the slumbered Sikkimese populace against the oppression made by the Kazis and Thikadars, the erstwhile ruling cliques of Sikkim. It is to be mention here that in the 40’s of the last century, few sons of Sikkimese peasantry, who hailed from this part began to dream for an egalitarian set up for the better administration of the kingdom of Sikkim. Keeping this in mind, they started an underground movement known as Member Party at a place called Namthang in South Sikkim. Amid to the paucity of political agenda and ideologies we are compelled to accept it as the first political organization of politically barren Sikkim. The foundation of such organization among the isolated Sikkimese peasantry has not only lighted the idea of political consciousness but, also rejected the opinion of Karl Marx which says “they cannot represent themselves: they must be represented”. But, Sikkim formerly being a secluded Kingdom, such instances had never received any attention from the enlightened historians. In the midst of a hegemonic, autocratic or authoritarian political structure people from the other parts of the Kingdom began to raise the voices against the corrupt practices of the ruling cliques. If we have to justify these incidents from a subaltern perspective than one can say that a tussle was on its way between the subalterns and the elites. With the foundation of Rajya Praja Sammelan in 1946, by the peasants of Temi Tarku, South Sikkim has plunged itself on its way towards democracy. The silent whispers of the remote villages began to make a huge clamor when the educated sons of peasant families like Chandra Das Rai of Namchi, Nayan Tshering Lepcha of Namthang, and the Tiwari brothers of Temi Tarku began to join it. The need of an umbrella organization in Sikkim was also felt by the South District which ultimately paved the way for the establishment Sikkim State Congress on 7th of December 1947. Mr. Chandra Das Rai from Namchi delivered a flamboyant speech to the masses in his flawless Nepali which also played a vital role in breeding the ideas of resistance among the politically illiterate Sikkimese peasants. In the anti-merger movement of the 70’s people like Durga Prasad Rajalim of Namchi played an imperative part to protect the inviolability of his motherland. Further, the place has also produced people like ex- Chief Minister Mr. N. B. Bhandari (who had his education at Namchi and later started his political career from the very place) and the present Chief Minister Dr. Pawan Chamling. In sports too, South Sikkim has given us Mr. Bhaichung Bhutia, the star of Indian Football and Tarundeep Rai the Indian archer. In addition to these, the district has given birth to poets like Agam Singh Tamang APATAN and many other talents related to various fields. Thus, the historical importance of South Sikkim cannot be underestimated. During my eight years of stay at Namchi, I tried my best to find some old pictures of it. 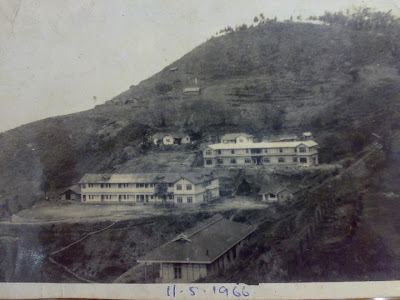 I have been able to stumble on an old picture that dates back to the 40’s but, due to a very low resolution I am unable to identify the place. Somebody told me that the picture was taken in 1949 in the midst of No Rent Campaign at Alley Ground. It is to be noted here, the new Indian Dewan John S Lal had to face a great difficulty posed by the State Congress when he reached Namchi to collect the tax from the peasants in the said year. He got an experience of the people’s attitude during his visit to Namchi; he had to face a huge demonstration led by the State Congress leaders Nayan Tshering Lepcha and Chandra Das Rai. But, I am not sure weather the picture is related to this event or not. Therefore, until I will not be able to get authentic information about it its not appropriate for me to post it on my blog. However, picture of today’s post is reliable. It is a view of Namchi Senior Secondary School in the present day. This was taken by some unknown person in 1966. I am greatly thankful to Anup Sarkar for sharing this valuable piece of information with me. The picture speaks many words about Namchi, the present District Head Quarter of South Sikkim. Namchi has played an imperative part in the history of Sikkim. If we go back to the reign of Chador Namgyal (1700-1716 AD) the Pende Ongmoo affair allocates a special place in the Sikkimese history. It is said that Pende Ongmoo was executed at a place called Pende-Lhaptse, a few kilometers away from today’s Namchi town. It is necessary to discuss here about Pende Ongmoo, who has shared, such a special place in the early history of Sikkim. Pende Ongmoo sometimes written as Pende Wangmo was born of the first wife of King Tensung Namgyal (1670-1700 A D) who was a Bhutanese princess. During the accession of Chador Namgyal, she put a strong opposition regarding the succession of her brother. For her, being the eldest child of the deceased King Tensung Namgyal she was the legitimate successor to the throne of Sikkim after her father. Her stubborn nature led her to invite a force from Bhutan to assassinate the boy king who was just 14 during his accession. A loyal minister of the Sikkimese Court Yugthing Yeshe took the boy King to Lhasa via Ilam and Walong (then in western Sikkim now in Eastern Nepal). The event led to the Bhutanese occupation of Rhabdentse, then capital of Sikkim. For nearly 8 years of occupation the Bhutanese withdrew themselves from Sikkim with the mediation of Sixth Dalai Lama of Tibet. But, Pende Ongmoo was not reconciled. She was in search of an opportunity to take a beautiful chance to capture the throne of Sikkim. In 1716, when the King Chador Namgyal was at Ralang hot spring Pende Wangmo conspired with a Tibetan doctor to cause bloodletting from a main artery. The doctor, in a pretext of check-up cut the main vain of the king that caused his death. After the death of the king, a force was sent to Namchi to execute the Tibetan doctor and the crooked princess. The doctor was granted a fierce death by the Sikkimese ministers. Likewise, Pende Wangmo strangled to death with a silk scarf inside a room of the said palace. Few years back, I have visited the said place which is now at the verge of its downfall. It is a palace built for Pende Wangmo by then ruler of Sikkim. The most unfortunate matter which I witnessed during my visit was the least paid attention of the concerned authority to preserve the heritage. In some unknown period, to keep the structure stand, few iron pillars were erected which now bowing down due to the heavy load of the building. If some effective measures are not taken to protect this ‘living history’, within few years it will get collapse which would not only lead to a loss of an old building but also a treacherous page of Sikkim History. Note:- The picture shown above was taken few years back and due to a low resolution its not properly visible. Latest picture of the site will be featured soon on this blog.